Most organizations begin their D&R Journey with a D&R Toolkit, which provides everything you need to launch you own internal Campaign. The D&R Toolkit can be supplemented with D&R Workshops for leaders, managers, and staff focused on 7 Pillars. 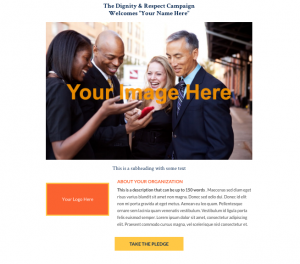 D&R Initiatives are available online to support your ongoing efforts and reinforce the concepts of dignity and respect. You can purchase items for your launch event, employee and community programs, or department activities in the D&R Store. 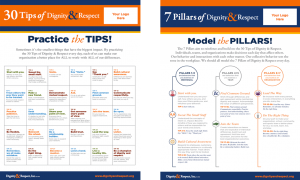 Interested in ordering a Dignity & Respect Toolkit?